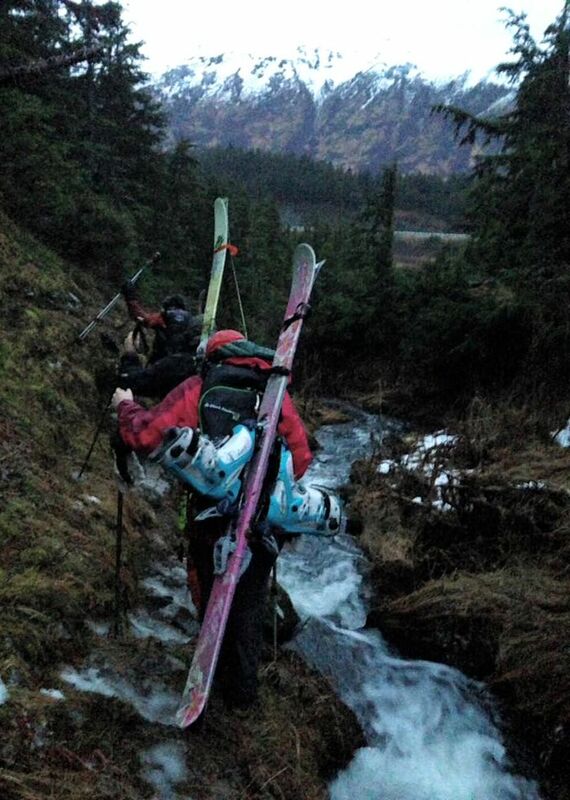 This is an installment of Cautionary Tales, an ongoing series about lessons learned the hard way in the Alaska outdoors. "We'll just go to those trees over there." I wiped the sweat from my forehead as my eyes followed the direction my friend pointed in. They landed on a scraggly cluster of trees about 50 yards away, and I thought: 50 yards. I can do this. One foot in front of the other, hiking on the snow, planting my poles after each movement forward. Step, step. Plant, plant. "Actually, let's head up to that ridge." OK. That didn't seem too far away, but the skis on my back kept catching the occasional branch. "How about those trees over there? You can at least make it over there." I shot my friends The Look and took out my inhaler. Step, step. Plant, plant. Puff, puff. 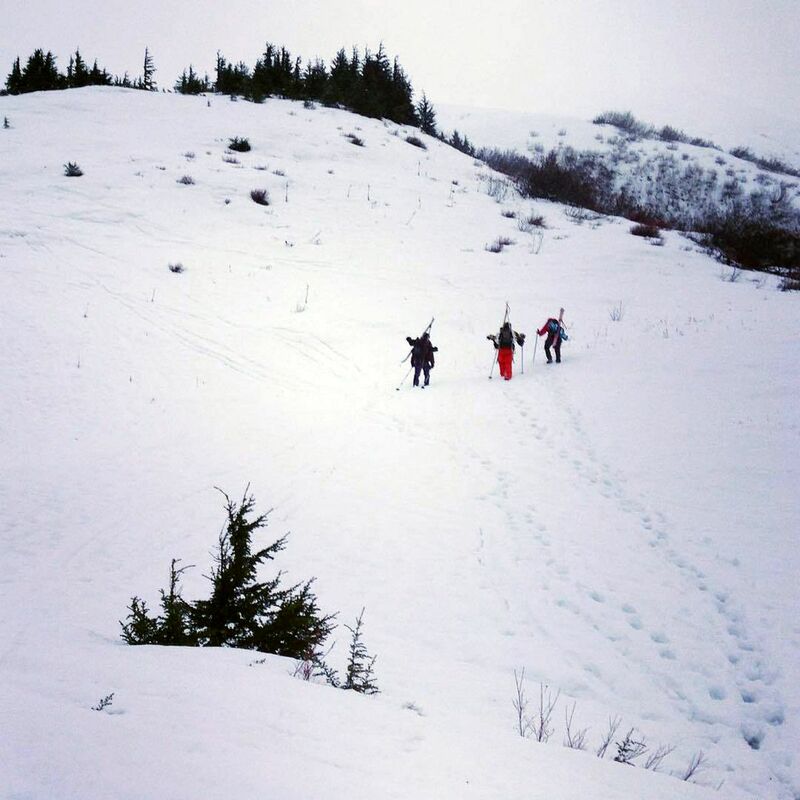 Mercifully, once we arrived, they dropped their packs and I heard the crack of an opened beer — a telltale sign it was time to put on our skis and ride downhill. That day last November at Tincan Peak had not started auspiciously. Usually, when I picture a backcountry ski outing, I have skis on my feet and the day starts when I skin uphill. This time, when we arrived at the pullout along the Seward Highway, I was confused. "Where are we supposed to ski?" What I saw in front of me was a field of mud and soggy tundra. Patches of snow weren't visible for another half-mile. Skiable terrain was a trek away. I didn't realize that my friends, who were jazzed to get in an early season ski, had come prepared with trail runners. The thought of sloshing through mud in my ski boots made me shudder, so I slipped on the only other footwear I had: bulky Sorel boots meant for winter, not the marshy conditions that lay before me. Clumsy footwork after a weekend when I'd already pushed my body on other hikes left me dragging my feet, literally, as we slogged up to skiable terrain. My friends sensed my flagging motivation. I'm not sure what gave me away — perhaps it was my desperate plea for them to leave me behind, or the occasional inhaler stop, or the distance between us that widened as they stayed on pace and I ambled behind. But they kept me going with their sweet, beautiful lies about when we'd finally stop trudging uphill and begin skiing. Please note that I don't quite condone lying to adventure partners. Under the wrong conditions, that's a recipe for disaster. But once in a while, such tactics are necessary to keep friends like me from falling by the wayside. When friends know you well, they know where your limits are. Occasionally, I'll tell myself small lies. On long, flat routes, I'll joke with myself or others and say, "We're halfway there." At every stop, I'll check the map: "We're halfway there." Then I'm pleasantly surprised when I arrive at my destination. On the other hand, truth can be a powerful motivator. Last week's hike of Penguin Ridge in conditions that started out ideal and quickly turned nasty — 40 mph gusts, low visibility, rain, snow, then eventual darkness — was especially demoralizing. I had passed my breaking point and considered telling my friends to go on and leave me to bivy, or die. But then one of them said, "We've just got 2.9 miles to Penguin Peak," the last high point on our 15-mile ridge route. My heart soared. I could put up with 3 more miles if it meant I could cruise downhill from there. I've found that bargaining is a useful strategy as well. I know more than a few parents who have incentivized hikes with their kids by promising Skittles or M&Ms at "the next stop." I'm not a child, but I've had to deploy this maneuver on myself on brutal trips. Gummy worms and mini-Snickers bars are particularly effective. No matter what keeps me going — lies, truths, sugar — my outdoor partners know how best to motivate me and how far to push me. Sometimes our roles are reversed, but the underlying concept is the same: It all boils down to understanding. There's no substitute for good friends on outlandish adventures. And at the end of the day, when we're reflecting on how great (or sketchy) the skiing was at Tincan or how beautiful that day at Penguin Ridge started, we're able to laugh about all the times I told my friends to leave me for dead.